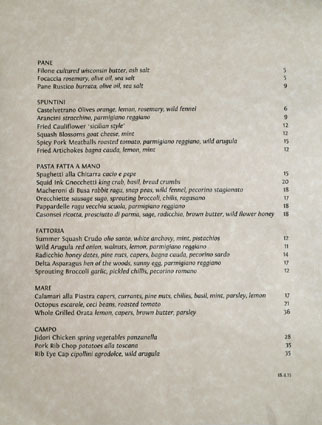 The last time we saw Evan Funke was March 2011, when he was heading up the kitchen over at Rustic Canyon. 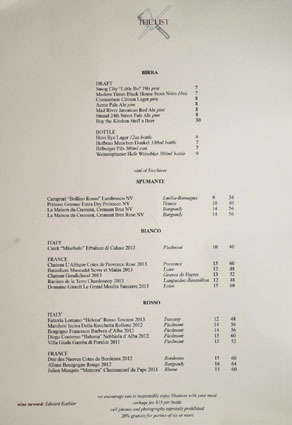 He also opened Milo & Olive that November, but left both restaurants at the end of February 2012, replaced by Jeremy Strubel and later Jeremy Fox at Rustic, and Walter Manzke and Jason Mattick at Milo. 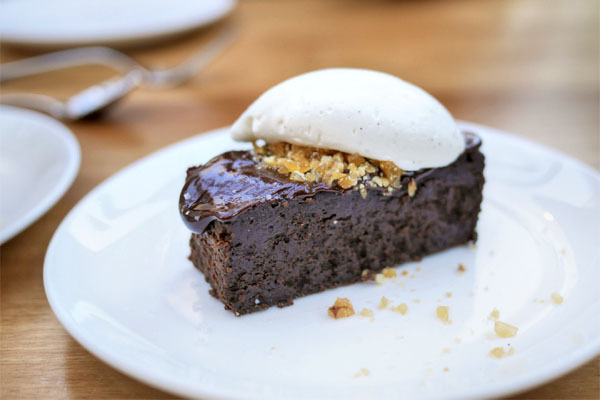 In July, Funke announced plans to take over the building previously home to Beacon, the longstanding Asian fusion eatery from Kazuto Matsusaka and Vicki Fan (the two are now at Superba Food + Bread) that was supposed to become Michael Cardenas and Perfecto Rocher's Taberna Arros y Vi. 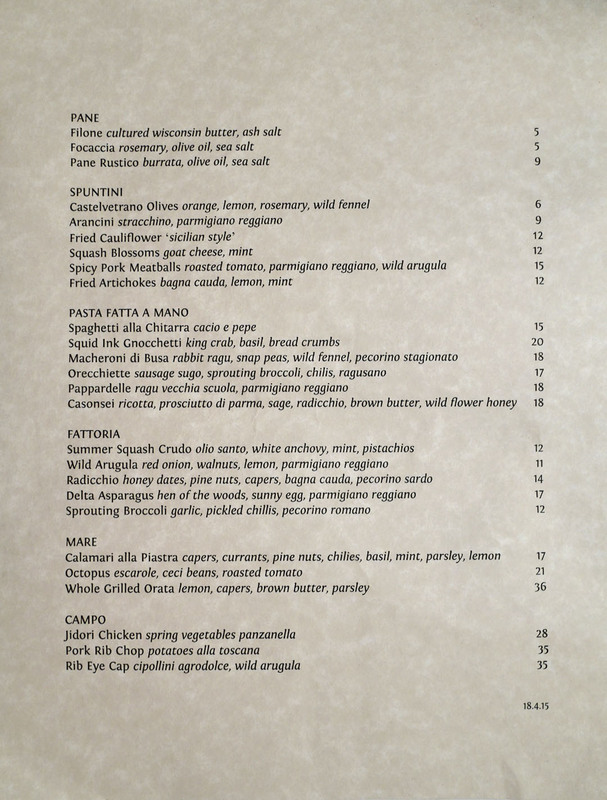 In December 2012, the Chef launched his Porchetta Truck, which was supposed to serve as a stopgap before Bucato's debut. The restaurant got caught up in construction though, and the truck ran until the end of February 2013, shortly after Funke cooked a one-night-only pop-up at Square One in Hollywood (the "this is not a pop-up" series). 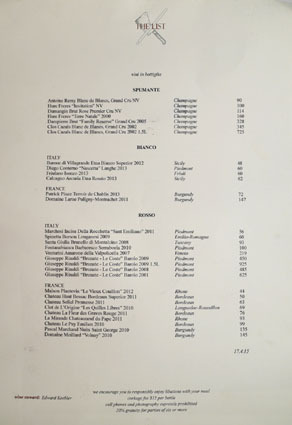 Things finally did come together though, and Bucato graced us on July 31st that year. 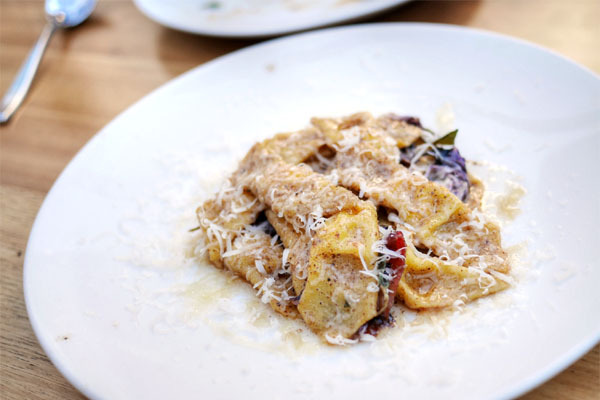 The focal point of Bucato's menu is rightfully the handmade pastas (made by Funke's longtime friend, pasta phenom, and sfoglino Kosaku Kawamura), which are joined here by a number of smaller plates and mains. 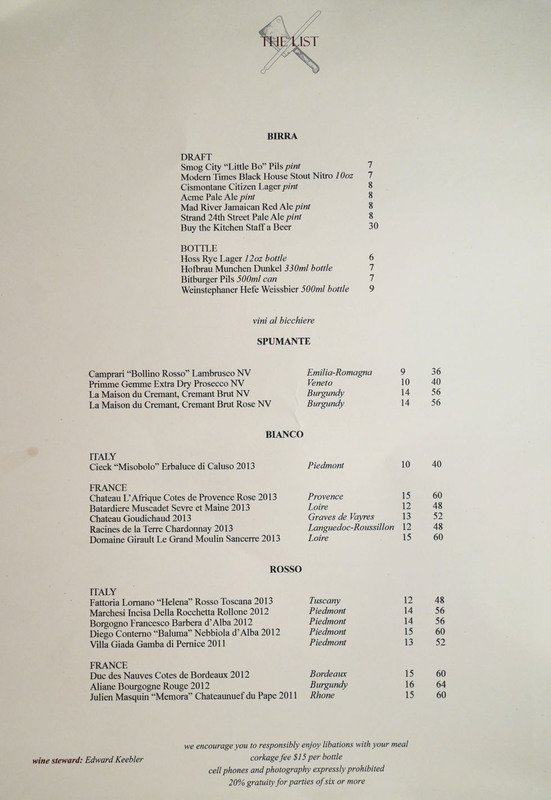 To drink, you get a small wine list of Italian- and French-leaning varietals by Managing Partner Ed Keebler and a smattering of beer (both on tap and bottled). 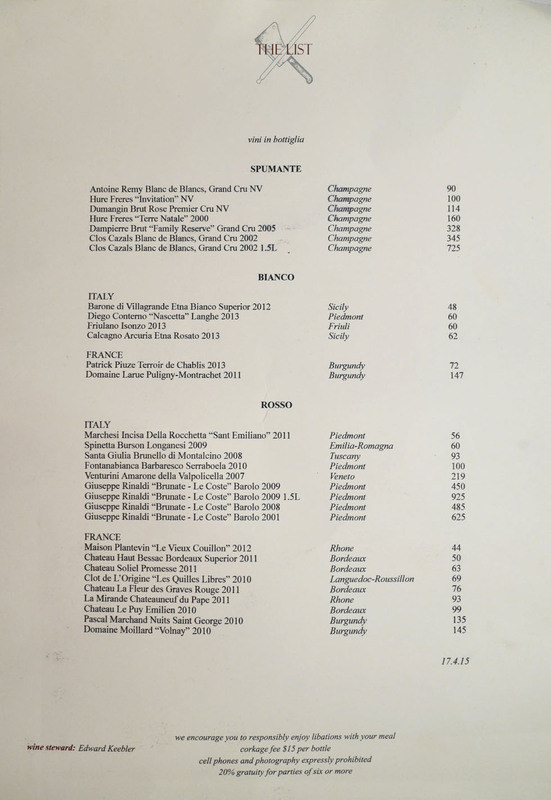 Corkage is offered at $15, limit 2. Click for larger versions. 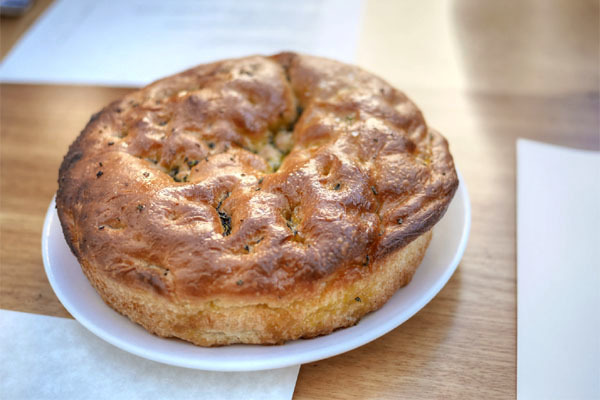 We began with the much bandied about focaccia, a prime presentation fluffy on the inside yet crusty, with a good balance between salt, herb, and olive oil. 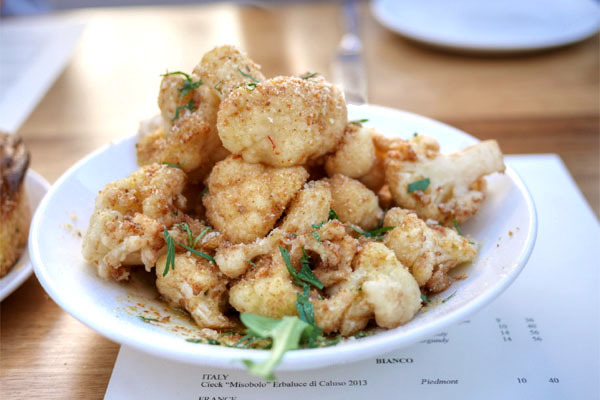 Cauliflower was a standout, coming out wonderfully crisp, yet still moist and tender, with a fantastic herbiness and spice to it. 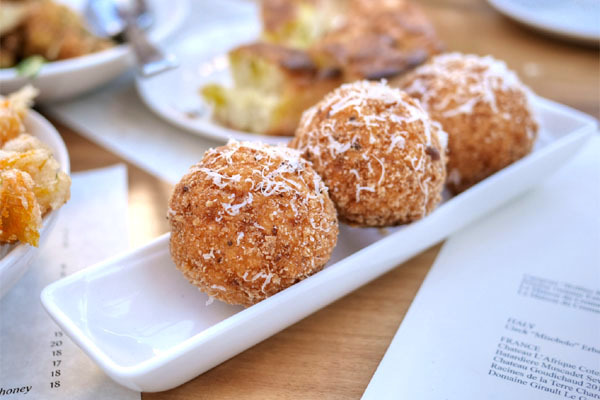 Arancini were on point, their crisp, crunchy exteriors hiding the lusciousness of the two cheeses and the satisfyingly al dente bite of the rice. 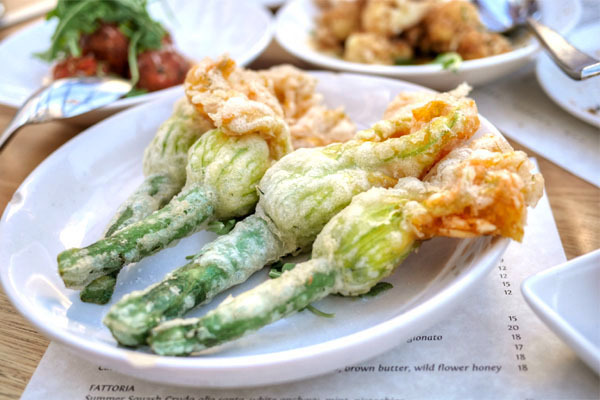 The squash blossoms were among the largest examples that I've had, and also some of the best, with the tangy, creamy goat cheese and mint combo working swimmingly against the bright, green nuances of the stalks. 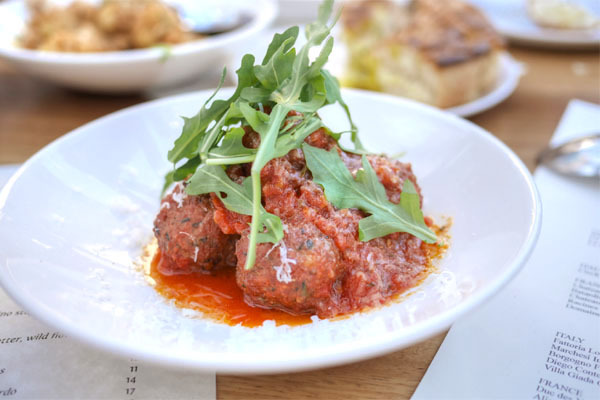 Meatballs signaled the end of our starters, and were another favorite of ours--beautifully textured, with a fantastic herbiness and porkiness to them cut by the tang of tomato sauce. 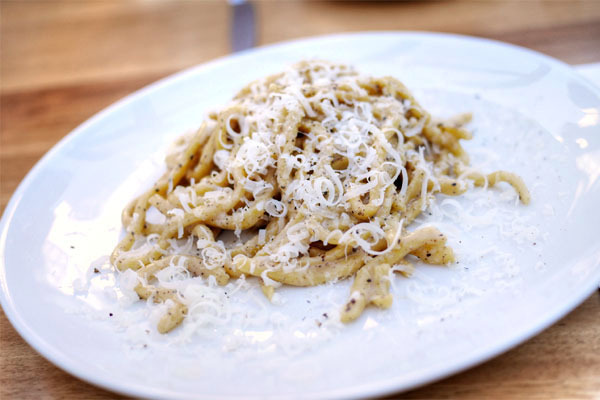 Our first plate of pasta, the spaghetti arrived dressed simply with cacio e pepe, a straightforward yet deeply gratifying dish that really highlighted the punch of the pepper, all while cheese added the requisite richness to things. 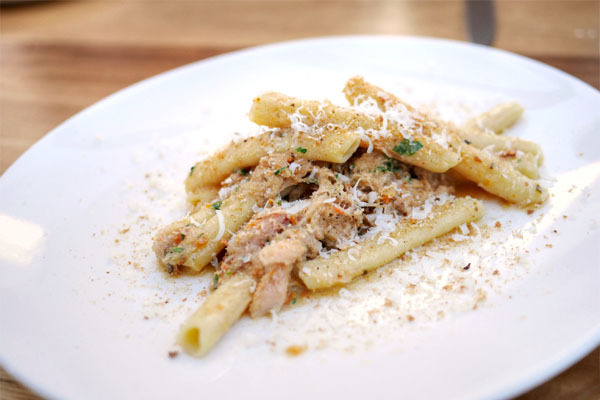 Rabbit was put to good use, arriving tender and teeming with all the heady savors that you'd expect, a pretty much perfect complement to the well-textured pasta. Wonderful crunch from what I believe were breadcrumbs, too, though I didn't get much from the snap peas. 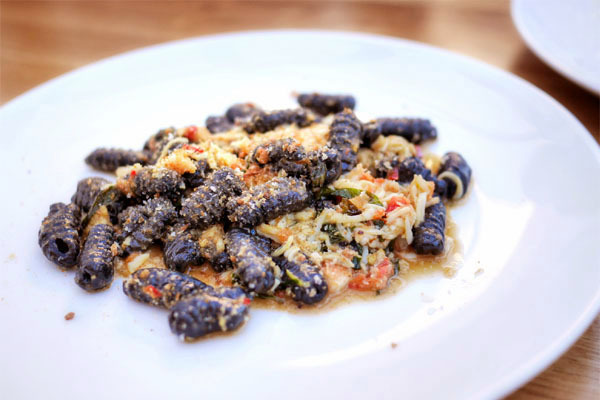 Gnocchetti were chewy little bites, a fitting base on which the briny essence of king crab could really shine. We ended with the most interesting of the pastas, a stuffed example that deftly balanced contrasting notes of sweet and savory. We were especially fond of the restrained use of brown butter here. 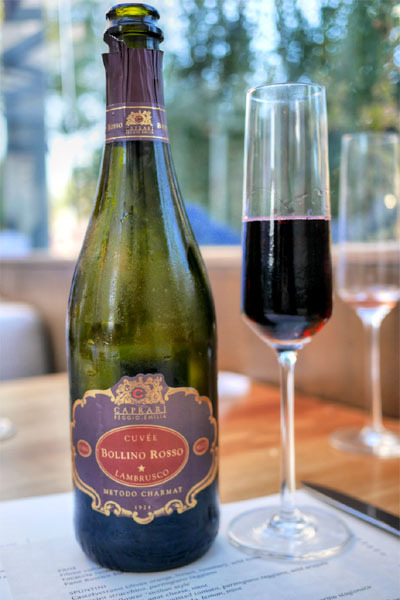 Our second wine was the Caprari "Bollino Rosso" Lambrusco NV, Emilia-Romagna [$36], a delightfully easy-drinking sparkler that gave up juicy notes of dark red fruit intermixed with an offsetting spice. Lovely. Getting into the larger plates now, the ribeye arrived with a fantastic bit of smokiness to it that really highlighted the inherent flavors of the steak. I was a fan of the zesty arugula here too, but the agrodolce I found overly sweet, as it tended to mask the beef somewhat. The octopus was a must-get for us, and didn't disappoint. 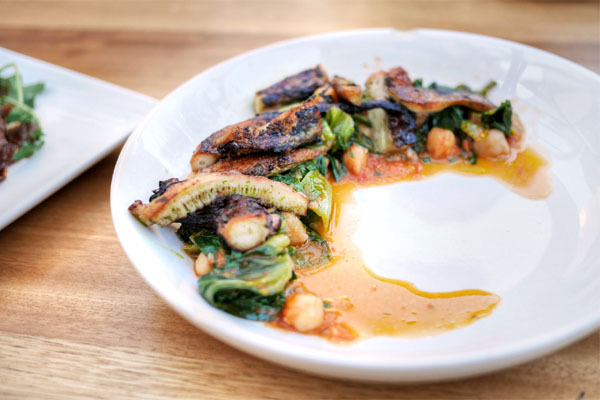 I got a really nice char and texture on the polpo, and the bitterness of the escarole worked flawlessly as a counterpoint. Superb textural element from the chickpeas to boot. Broccoli also delivered, arriving at the table crisp and astringent, the vegetable augmented by the aromatics of garlic and a sharp underpinning of spice while the Pecorino added hits of salt to the fray. 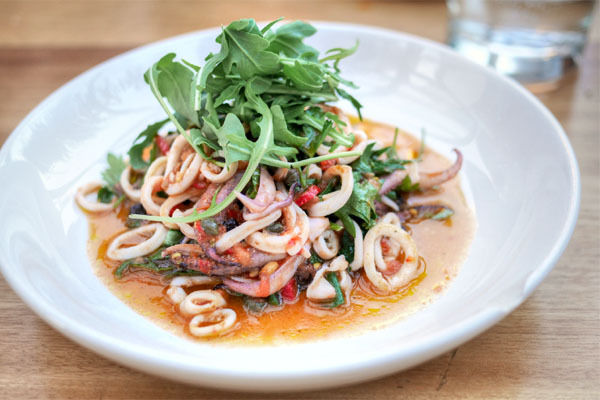 Our last savory of the evening, the squid was a surprisingly light, refreshing course, with the springy cuts of calamari paired with bright, herbaceous, tangy notes and a hint of sweet heat. 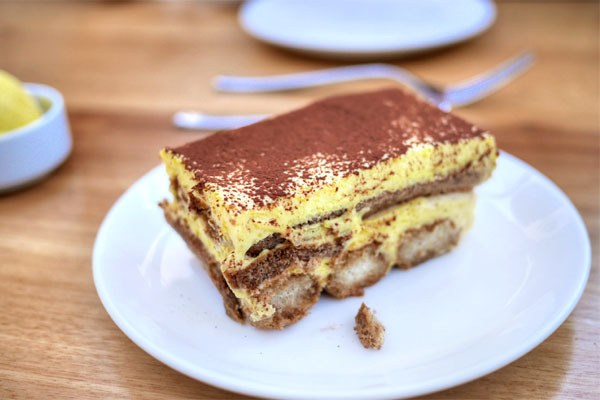 Our first dessert was the ubiquitous tiramisu. Bucato's was a worthwhile example, super airy and feathery almost, with a good balance between sugary and coffee nuances. On the opposite end of the spectrum, the flourless tart came out dense and heavy, with massive amounts of chocolate sweetness offset by the crema up top. Lovely texture from the sprinkles of rock sugar(? ), too. 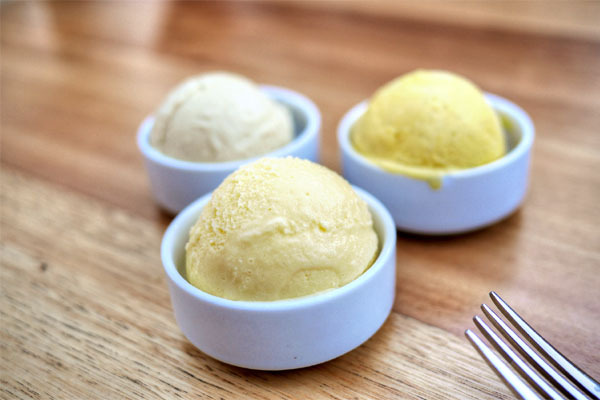 We closed with a trio of housemade gelatos. Clockwise from top-right, we had: a prototypical Vanilla Bean; a wonderfully sweet, almond-y Marzipan (my favorite); and a particularly true-to-life Pistachio. I'd been wanting to try this place out for nearly two years--ever since it opened--but the no-photo and no-phone policy kept me away until now. Enforcement of said policy was lax, at least on this evening; though I was discreet with my photos, my dining companions were openly using their phones with nary a peep from the wait staff. Rules aside, the food was good, quite good actually, seemingly uncomplicated plates that somehow still dazzled in their complexity, authenticity, and depth of flavor. I'm pretty sure that Bucato's got some of the strongest pasta in the City, and the rest of the cooking is right up there as well. 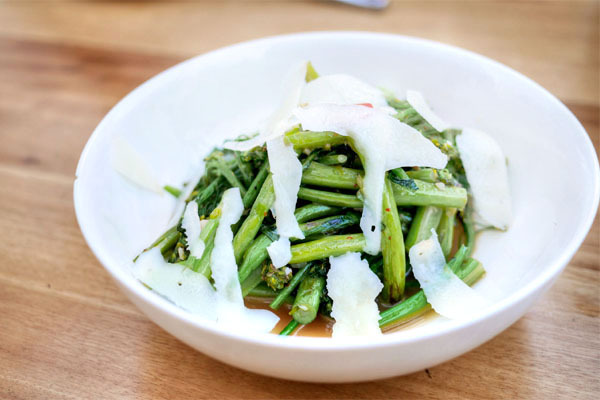 As for what's next, Funke is supposedly working on a second restaurant, also in Culver City. 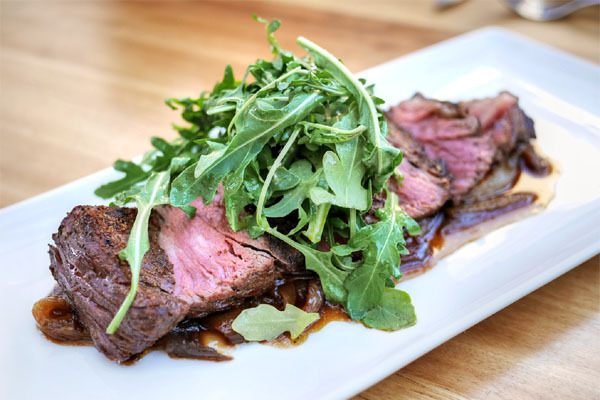 Named Thoroughbred, it's a modern, all-day take on the classic American diner, and is set to debut at the Platform at Hayden Tract later this year. I'll be looking out for sure. Following our meal, we moseyed on over to Father's Office next door. 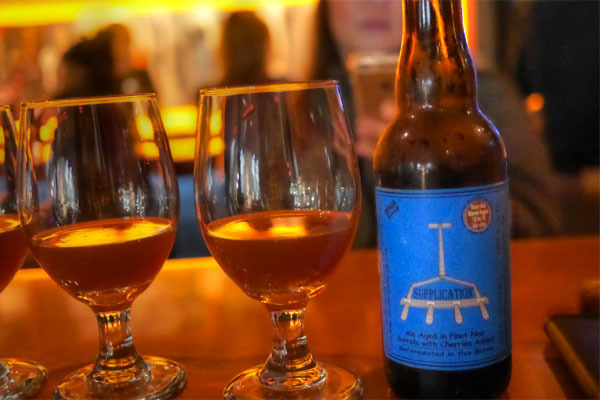 After drinking a couple of their beers on tap, we learned that the bar offers some off-menu selections as well and ordered a vintage bottle, the 2007 Russian River Supplication. A sour brown ale aged over a year in pinot noir barrels with sour cherries, the beer had benefitted nicely from its extended rest. There were some wonderful aromatics here, and taste-wise, we found a pointedly puckering, Brett-y, acidic character with a great oaky quality, all with an undercurrent of cherry that became more apparent toward the close. Delish. 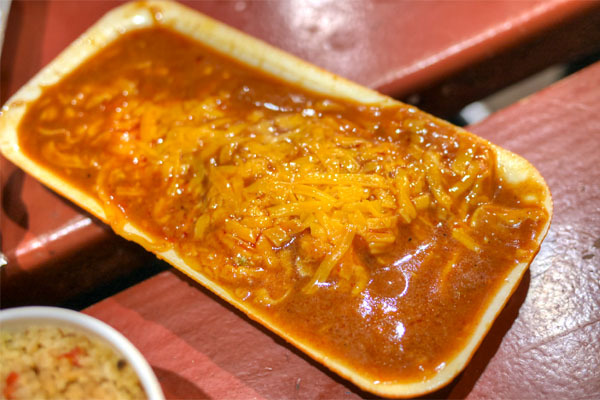 Our appetites reinvigorated, we headed over to Mexican mainstay Tito's Tacos. 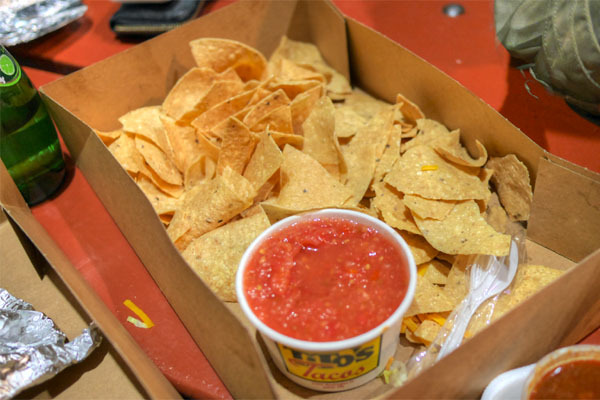 Copious amounts of chips were provided to accompany the thin, watery, though somehow satisfying salsa. 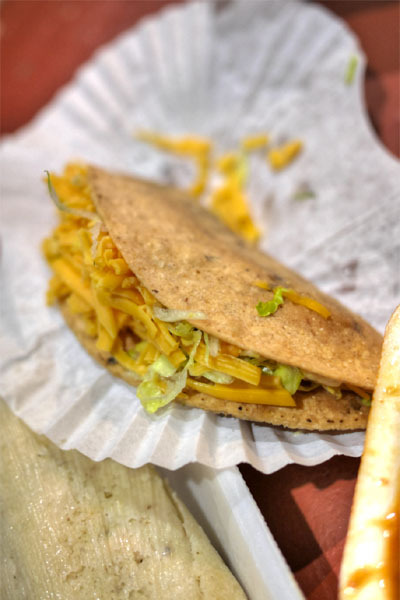 The signature taco was gratifying in that slutty sort of way, the combination of spiced, finely-ground meat, lettuce, and yellow cheese really hitting the spot, especially when generously doused with the aforementioned salsa. 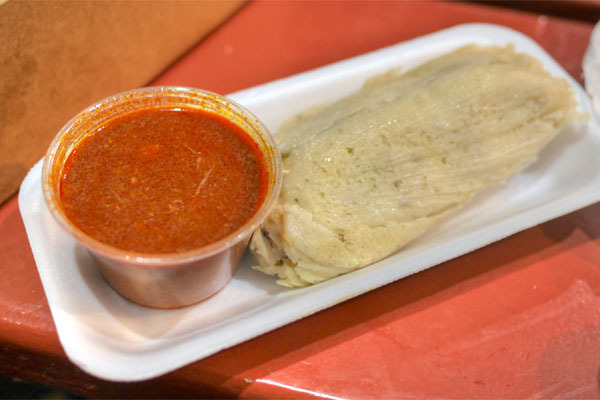 The tamale was better than expected, with the masa working fairly well with the chiles and chicken within. A dip in the smokier salsa on the side was definitely called for. 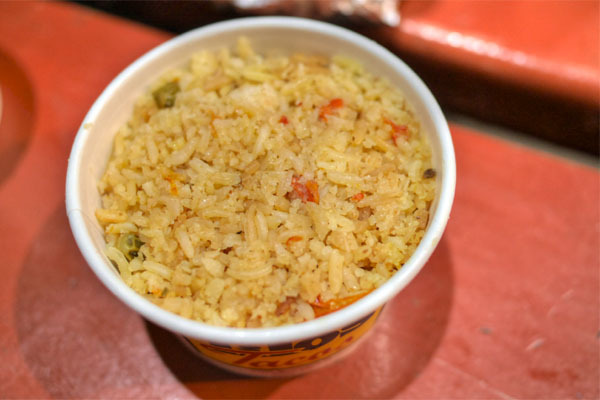 The rice was pretty palatable, and worked to temper some of the more potent tastes here. Tito's enchilada wasn't quite as successful, coming out quite muddled flavor-wise. 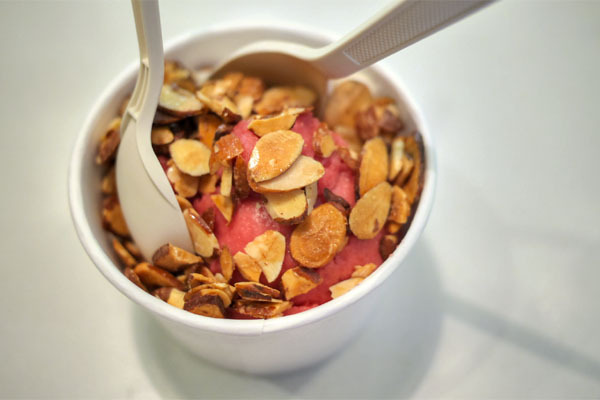 Finally, sa-cha brought us to Sweet Rose Creamery in Brentwood for their Coconut Lemongrass Cherimoya Sorbet and Blood Orange Sorbet with Crispy Almonds. Some refreshing, very true-to-life fruit flavors here, though I didn't feel that the nuts were necessary. What a night of eating! Awesome! Kevin: Indeed it was. I'm curious though, what's the WWDB stand for? Andy: I ate here on April 18th, and I'd written this report shortly after that. However, Funke left before I could post it, so I just added the note up top last minute.